Golden Hornet is a well-known crab-apple which has pink-white blossom in spring, and small yellow persistent fruitlets. 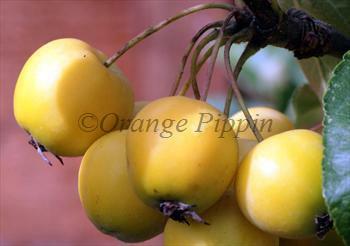 The fruits are useful in the kitchen, for crab-apple jelly and as a source of pectin for jam-making. Please fill in the details below and we will let you know when Malus Golden Hornet crab apple trees are back in stock. 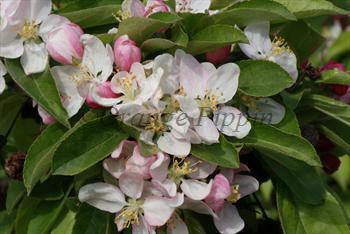 A very good pollinator for all late-flowering apple varieties.? 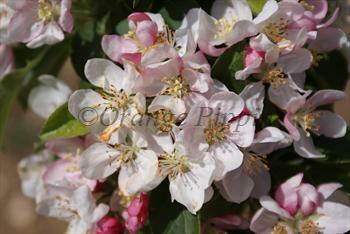 Malus Golden Hornet is in flowering group 5. Malus Golden Hornet is self-fertile and does not need a pollination partner, although fruiting may be improved if there is a compatible tree of a different variety nearby. Golden Hornet is more susceptible to scab when grown in areas with wet climates than some other crab-apples. Golden Hornet is was discovered in the UK in the first half of the 20th century. It is possibly a natural cross between Malus sieboldii calocarpa and Malus prunifolia coccinea.